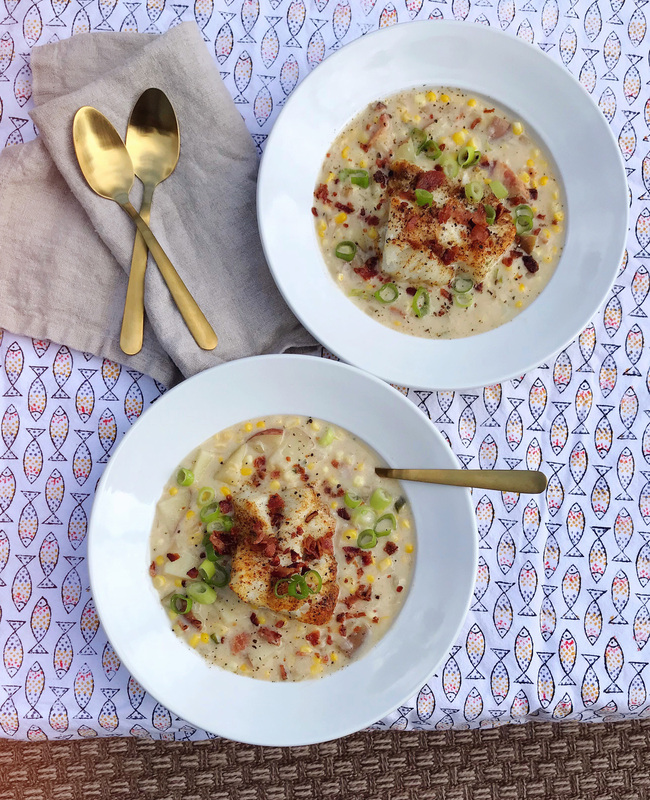 Summer Corn Chowder with Cod. I’m really excited to share this recipe with you today because it’s one I’ve been working on for a bit! I love a corn chowder. While most young adults gain the freshman 15 at college from drinking too much beer, I gained it because I used to eat corn chowder for lunch 3x a week at the Au Bon Pain (ironically) located underneath our campus gym. 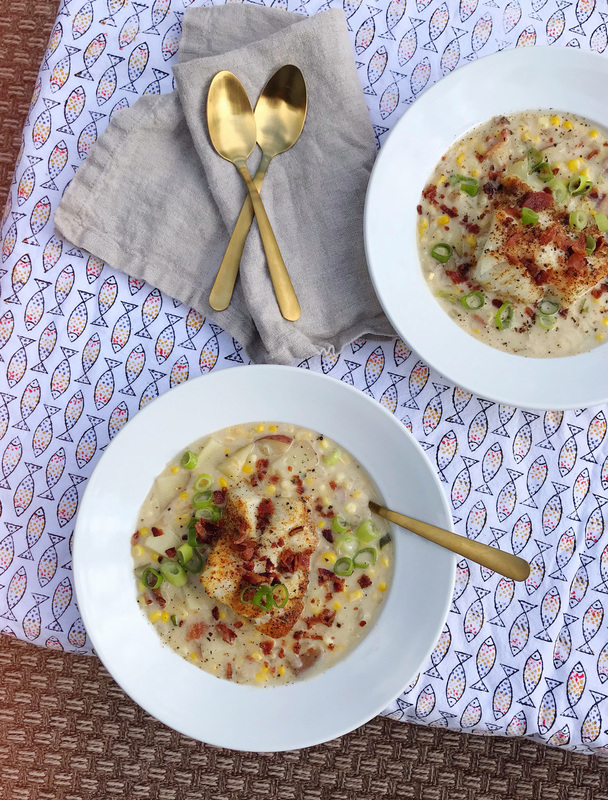 I debated with someone recently about corn chowder being a summer dish — it is, after all, the season when corn is at peak-tastiness. And I find it to be a delicious thing to eat on a cool summer night by the beach. I made a batch of it when we were on the Cape a few weeks ago, and decided to tweak the recipe a bit more another night last week. This spin has lots of spiced flavor from the cumin and chili powder, balancing out the sweetness of the corn. One of my favorite local restaurants serves a version of this dish with a potato crusted haddock, which inspired me to give my own recipe a seafood addition. I served it with a piece of blackened cod on top, and it was a hit. Even Jane got in on the action and had a piece of the fish and some corn — yum! Get the recipe below. In a large pot, cook the bacon crispy, about 5-7 minutes. Remove the bacon the pot and set aside to cool and then cut into small pieces. Add 3 Tbsp. of butter, the diced onions and shallots, and cook until softened and translucent. Stir in the flour, 2 tsp. of cumin, and season with salt and pepper. Cook for 3-4 minutes until the flour creates a roux. Add the chicken stock, half and half, corn kernels, diced red potatoes, scallions and bacon pieces. Simmer for 20-30 minutes, until the mixture thickens and the potatoes are cooked through. While the chowder is simmering, pre-heat the oven to 400 degrees. Place the cod in an oven-safe dish and coat the fish with 1 Tbsp. of melted butter. Season the top of the fish with 1 tsp. of cumin, 1 tsp. of chili powder, and salt and pepper. Bake in the oven for 25-30 minutes, depending on the thickness of the fish, until cooked through. During the last 2 minutes of cooking, turn the oven to broil to crisp the seasoning on the top of the fish. 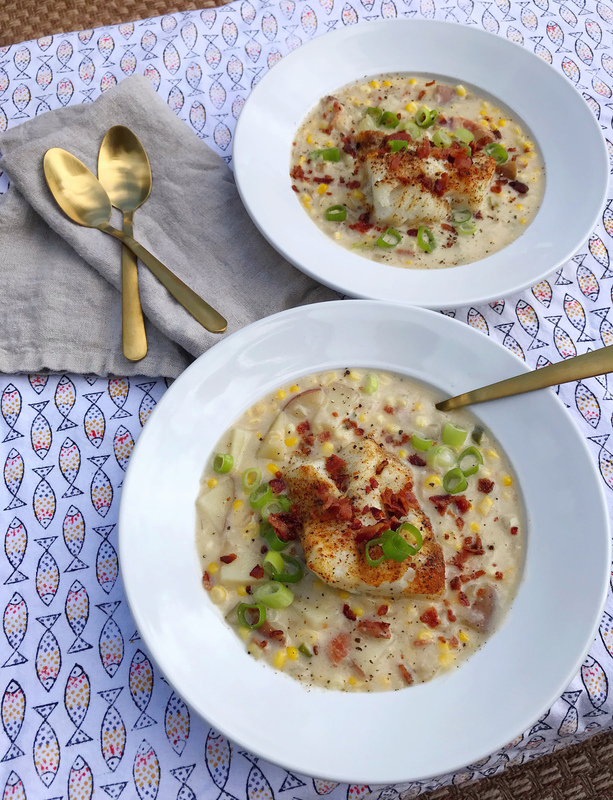 Ladle the corn chowder into dishes and place fish pieces on top; garnish with additional fresh scallions. The Download – 08.03.18 Ricotta, Pea and Parmesan Pasta.